CLASSIFIED - Buy, sell and post want ads for old marine engines and parts. This link will open a new window on affiliate site, MarineEngine.com. Be sure to come back. DISCUSSION - Message board for old marine engines. Ask your questions and answer others. 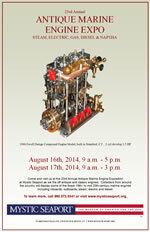 HISTORY & INFO - Marine engine company histories, advertisements, and photos. TECHNICAL - Technical articles and information on engines, carburetors, ignition, gears, two cycle vs. four cycle, etc. Early marine inboard engines are also known as one-lungers , make'n'break, or make and break engines. They could be two cycle or four cycle design, but were most commonly two cycle, and could be single or multi-cylinder. They were built in large factories such as Palmer Brothers, Lathrop, Gray, and Lozier, as well as small local machine shops, machining and assembling castings in limited numbers. The focus for OldMarineEngine.com will be the pre-1940 engines built for motor canoes, motor launches, dories, skiffs, and other pleasure or work boats up to about 30' in length. Thanks for visiting. LINKS PLUS - Links for museums, personal pages, associations, suppliers, etc. STORE - Books, catalog reprints, and plans. E-MAIL - Contact us with contributions of company histories or technical articles. Any thoughts on how to improve this site are appreciated. I hope that antique marine engine enthusiasts will find this site useful as a place to gain more knowledge and enjoyment of the hobby of collecting, researching, and restoring "one-lung" marine engines. Your use of the site will help make it interesting and enjoyable for others. If you have articles or historical information about marine engine builders or about a restoration that you have done, and would like to share it with other collectors, please let me know. If you have suggestions for other items of interest to marine engine collectors and restorers that we should offer in our store, I am always interested. Please also participate in the DISCUSSION and the CLASSIFIED areas of this site. Click here for information on new engines of all kinds. Copyright � 1999 - 2013 All rights reserved.